Years of disagreement between the North and the South finally burst into civil war in April of eighteen sixty-one. Seven states in the South had withdrawn from the Union. Soldiers of the new Confederate States of America shelled the Union base at Fort Sumter, built on an island in Charleston Harbor in South Carolina. They captured Fort Sumter after two days. President Abraham Lincoln asked the states of the Union for seventy-five thousand soldiers to help end the southern rebellion. Northern states quickly sent forces to Washington. But border states -- those between the North and the South -- refused to send any. Some prepared to leave the Union and join the Confederacy. This week in our series, Steve Ember and Shirley Griffith describe the first days of the American Civil War. The first state to secede after the start of the Civil War was Virginia. It was an important state because of its location. It was just across the Potomac River from Washington. 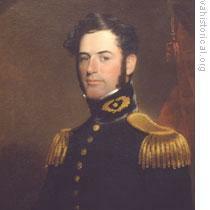 Virginia's decision to secede cost the Union a military commander of great ability. He was Robert E. Lee. Lee was a Virginian and had served in the United States army for more than thirty years. Lincoln asked him to be head of the army when General Winfield Scott retired. Lee said he could not accept the job. He said he opposed secession and loved the Union. But, he said, he could not make war on his home state. Lee resigned from the army. He did not really want to fight at all. But soon after his resignation, he agreed to command the forces of Virginia. Virginia's forces moved quickly after the state seceded. A group of one thousand soldiers went to Harpers Ferry, Virginia, where the Union army had a gun factory and arsenal. It was the same town where abolitionist John Brown had tried to start a slave rebellion a few years before. The United States force at Harpers Ferry was small. The soldiers could not defend the town against the Virginians, so they left. Before marching away, the soldiers set fire to the gun factory and arsenal. The fire did not destroy all the equipment at the gun factory. When the Virginians captured the town, they sent the equipment south, where it was used to make guns for Confederate soldiers. Virginia's forces also moved against the United States' biggest navy base, which was at Norfolk, Virginia. Once again, the Union force withdrew. Before leaving, it burned every building and sank every ship. President Lincoln was becoming increasingly worried about Virginia's military moves. He was afraid Confederate forces in Virginia might try to capture Washington in the first days of the war. After all, the Confederate secretary of war had declared that the Confederate flag would fly over the Capitol building before the first of May. Washington was not strongly defended. It did not have enough soldiers to stop any real attempt by Confederate forces to seize the city. It was extremely important to get more soldiers to Washington as quickly as possible. Thousands of men were on their way to Washington. But they could not get there quickly. Troop trains had to pass through the state of Maryland to get to Washington from the North. Many people in the state supported the Confederacy. The governor, however, did not. He refused to call a meeting of the state legislature. He was afraid it might vote to secede. He wanted to keep Maryland neutral. The first troop train from the North passed through Baltimore, Maryland, without incident. The second train was not so lucky. A mob blocked the rail line and threw stones at the train. Shots were fired. Four soldiers and twelve civilians were killed. State and city officials met to discuss the trouble. They agreed that there would be even more violence in the future. So they ordered railroad bridges outside Baltimore destroyed. No more trains from the North could reach Washington that way. President Lincoln told the officials of the great need to get more soldiers to the capital. He agreed that they did not have to pass through Baltimore. But he wanted them to be able to land safely at Annapolis, a city on the Chesapeake Bay. Landing at Annapolis would be easy. Getting to the capital would not. Supporters of the Confederacy had damaged trains, rail lines and bridges between the two cities. The first soldiers to land at Annapolis had to repair everything as they moved ahead. Still, with all these difficulties, ten-thousand troops made it to Washington in the first few weeks of the Civil War. The city and government were safe. President Lincoln worried about the presence of Confederate supporters in Maryland. He knew they would continue to be a threat to the movement of Union troops and supplies. Lincoln wanted to restrict the activities of the Confederate supporters. So he took an extremely unusual step for an American president. He put much of Maryland under military rule. He gave military officers the power to arrest civilians believed to be hostile to the Union. And he gave them the power to hold these suspects without trial. This order suspended two of the basic rights under the Constitution. One was the right to go free until officially charged. And the other was the right to a speedy trial. The chief justice of the United States wrote a letter to President Lincoln. He said the Constitution did not give the president the power to suspend the rights of citizens. Lincoln disagreed. He felt the situation facing the Union permitted him to take such strong measures. If he had not acted, he believed, Maryland would have seceded. Maryland did not withdraw. But North Carolina, Tennessee, and Arkansas did. There were now eleven states in the Confederacy. There could be two more. No one knew how long Kentucky and Missouri would remain in the Union. Both supported the southern rebels. President Lincoln treated Kentucky carefully. He did not want the state to secede. Nor did he want it to remain neutral. Kentucky reached from the mountains of Virginia to the Mississippi River. As a neutral state, Kentucky could block northern troops from much of the South. Lincoln wanted it firmly on the side of the Union. The president did not use force in Kentucky, as he had done in Maryland. Instead, he sent people to Kentucky to organize support for the Union. Newspapers were urged to publish pro-union statements. Home guard forces were formed. They received their weapons and supplies from Lincoln's administration. Lincoln hoped that, in time, these efforts would win Kentucky's support for his war effort. In Missouri, the governor tried hard to take the state out of the Union. He called a convention to decide the question. A majority of the delegates refused to vote for secession. The governor organized state soldiers. The Lincoln administration organized home guard forces. The two sides clashed several times. Some civilians were killed. The United States army finally seized government buildings in the state capital. They forced state officials, including the governor, to flee. Missouri would remain in the Union. The capital of the Confederate states of America was located far south in Montgomery, Alabama. Within the first few weeks of the Civil War, the Confederate Congress voted to move the capital farther north to Richmond, Virginia. They believed Virginia would be an important battlefield in the war. They were right. Two days before Confederate President Jefferson Davis left for Richmond, Union troops invaded Virginia. They left Washington, crossed the Potomac River, and seized the towns of Arlington and Alexandria. No shots were fired. Confederate forces withdrew as Union troops moved forward. Within a month, thousands more Union soldiers were in Virginia. They were to prepare for a major battle at a place called Manassas Junction, or Bull Run. Our program was written by Frank Beardsley. The narrators were Steve Ember and Shirley Griffith. Transcripts, MP3s and podcasts are online, along with historical images, at www.unsv.com. You can also follow our programs at twitter.com/voalearnenglish. Join us again next week for THE MAKING OF A NATION -- an American history series in VOA Special English.